Metro Magazine / metroMAGAZINE-Featured-Content 2011 / All About Scarves! We love summer scarves! Actually, we love scarves in general but summer scarves are a great way to spice up a basic tank or tee. As a habitually cold person, I love having a scarf with me when it can get chilly in the evening. 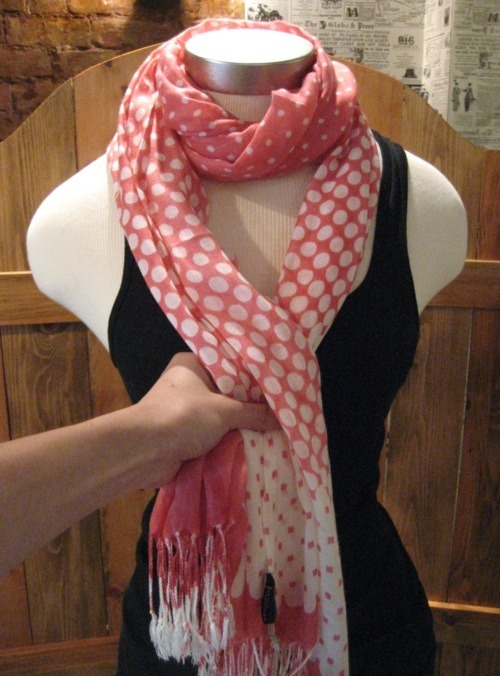 We have been getting in tons of great summer scarves and a big question we often get asked is how do I wear this? We’re here for you, we want you to get great use out of your scarves! We listed out 10 great ways to wear your summer scarves this year (and how you can achieve these looks). We scoured the Internet and played with the scarf a bit in the mirror ourselves to find our 10 favorite ways to tie your scarves. (These styles aren’t necessarily specific to summer scarves, feel free to rock these looks all year long). But first, what do you wear your scarf with? 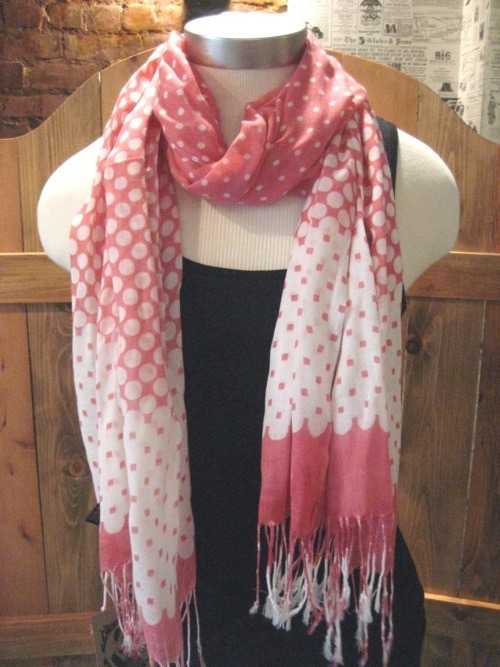 Pattern Scarves: I love patterned scarves, they really can be the star of the outfit! Pair your patterned scarf with a solid color top, pull inspiration from the colors in the scarf. If it’s a very bright colored pattern pair it with a neutral to make the scarf pop. Mix & Match: You can ABSOULTELY mix and match a patterned scarf with a pattern top, that is what this year in fashion is all about. 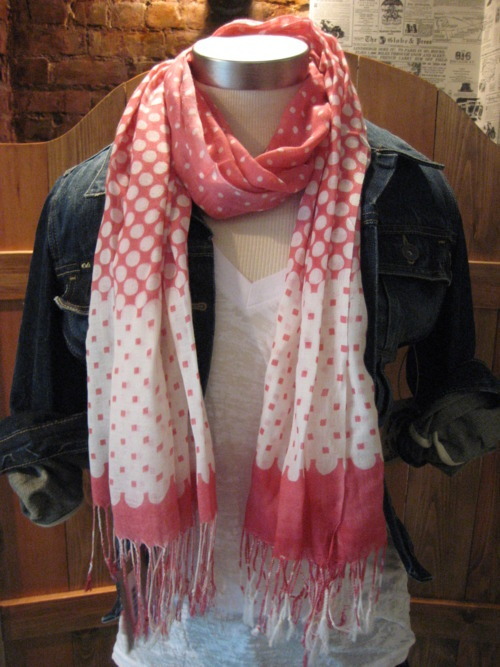 Mix a floral top with a stripe scarf or a polka dot scarf with a plaid shirt. I think the key to this is to make sure you are mixing when you match. Don’t do a floral scarf with a floral shirt or a stripe scarf with a stripe shirt. Have fun with it and play around! Solid scarves: Color blocking (mixing several bold bright colors) is huge this year so definitely wear your green scarf with a yellow shirt or any bright. I also like the solid color scarves with detailed tops. Try one of the ways listed below that shows off your shirt, such as the tied ends scarf tie. The key to this, as above, is try not to be too matchy. Mix up your solid coral scarf by pairing it with a cobalt blue top, not a pink or tangerine that is similar in color to the coral. 1. Around The Neck : This can be worn tied or open. 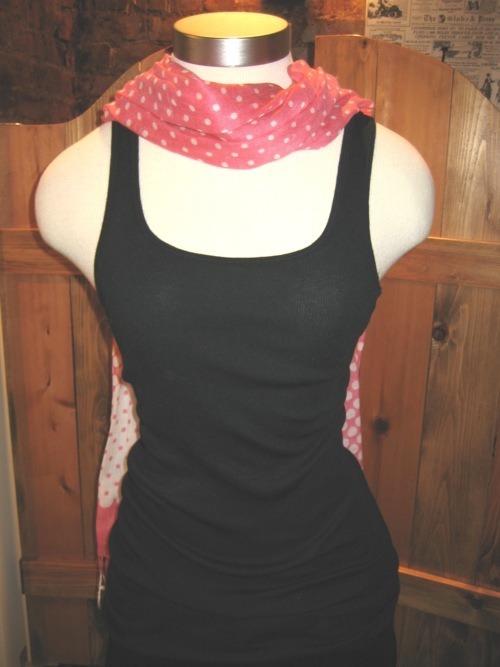 This is my go-to look for the summer, you can pull it down a bit around the neck so it is looser or up to tighten when cold. No need to waste a cute shirt when wearing this style, I like this for when I have on a simple tank top, it covers it up a good amount of my basic blah tank and adds color and pattern.